The Church of the United Brethren in Christ (United Brethren Church) was founded in 1800 by Philip William Otterbein (1726-1813), who came to America in 1752 as a missionary of the German Reformed Church, and Martin Boehm (1725-1812), a former bishop of the Mennonite Church in Lancaster County, Pennsylvania, who had been excommunicated in 1777 because of teaching Methodistic doctrine. Otterbein and Boehm were elected the first bishops of the church. Boehm took a considerable group of Mennonites with him into the new church, and others joined the church later at various places. Christian Newcomer, an early prominent leader in the United Brethren church, was one of the Mennonite ministers to transfer. The church was Arminian in theology and Wesleyan in ecclesiology. Between 1862 and 1870, Rev. 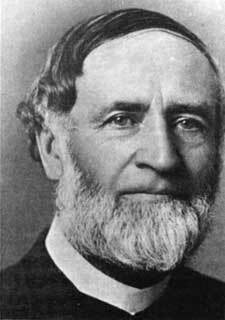 George W. Hoffman led a group that separated over infant baptism, membership in secret societies, slavery, and the bearing of arms in war. This group, known as the Hoffmanites, formally organized in 1877 and became known as the United Christian Church in 1878. In 1889 a minority of the church led by Bishop Milton Wright (father of Wilbur and Orville Wright) withdrew over a number of issues and became known as the Church of the United Brethren in Christ of the Old Constitution, while the liberal wing became known as the Church of the United Brethren in Christ of the New Constitution. A division within the churches in Canada also occurred in 1889. The Liberals took control of the denomination and expelled the more conservative group, known as the Radicals. In Canada, the Liberals eventually joined with another group, the Congregational Union of Canada, in 1906, and that group then joined with the Methodist Church of Canada and 70% of the congregations in the Presbyterian Church in Canada to form the United Church of Canada in 1925. In 1946, the Church of the United Brethren in Christ (New Constitution) in the United States, with a membership of 381,000, merged with the Evangelical Church to form the Evangelical United Brethren Church. Throughout the 20th century the Church of the United Brethren in Christ, descendants of the group led by Bishop Wright, continued to grow, especially outside of North America. In 2012, there were 10 national conferences located in the United States, Canada, Honduras, Nicaragua, Sierra Leone, Jamaica, Hong Kong, Mexico, the Philippines, and Guatemala. The total number of congregations was 500 with a total membership of approximately 45,000. The United Brethren Church in Canada. "Origin and History of the United Brethren Church in the United States and Canada." 2011. Web. 3 February 2012. http://www.ubcanada.org/history. Bender, Harold S. and Richard D. Thiessen. "Church of the United Brethren in Christ." Global Anabaptist Mennonite Encyclopedia Online. February 2012. Web. 23 Apr 2019. http://gameo.org/index.php?title=Church_of_the_United_Brethren_in_Christ&oldid=136537. Bender, Harold S. and Richard D. Thiessen. (February 2012). Church of the United Brethren in Christ. Global Anabaptist Mennonite Encyclopedia Online. Retrieved 23 April 2019, from http://gameo.org/index.php?title=Church_of_the_United_Brethren_in_Christ&oldid=136537. Adapted by permission of Herald Press, Harrisonburg, Virginia, from Mennonite Encyclopedia, Vol. 4, p. 1131. All rights reserved. This page was last modified on 6 October 2016, at 06:10.